November 22, 2013. The assassination of John F. Kennedy was exactly 50 years ago. What happened in Kennedy’s final hours? This is a liveblog on the events, from his departure in Fort Worth until the take off of Air Force One 3,5 hours later – now with a new President. 11:17 AM Air Force One takes off from Carswell Air Force Base in Fort Worth. During the flight to Dallas, John F. Kennedy goes over the morning’s Intelligence Checklist – daily routine. 11:30 AM Officer J.D. Tippit arrives home for lunch. “I made J.D. a sandwich, and he had some fried potatoes with it”, Mrs. Tippit remembers. It turned out to be her husband’s last meal. 11:35 AM Air Force Two lands at Love Field. Vice President Lyndon B. Johnson and Mrs. Johnson are aboard this plane. A routine: they arrive before Air Force One, so they can greet John F. Kennedy when his plane arrives. 11:42 AM Bonnie Ray Williams and Billy Lovelady are seeing Oswald on the fifth floor, waiting impatiently for them to send one of the elevators back up so he can come down. Charles Givens sees Oswald standing at the gate on the fifth floor as the elevator goes by. Meanwhile, at Dealey Plaza, photographer James W. Altgens arrives at the intersection of Main and Houston Streets where he remains until the motorcade arrives. He would take some famous photos. 11:51 AM J.D. Tippit returns to duty after having lunch at home. He starts driving back toward his patrol district. Charles Givens now observes Lee Harvey Oswald reading a newspaper in the domino room on the second floor, where the employees of the Texas School Book Depository eat lunch. 11:52 AM Marina Oswald, who still hasn’t dressed for the day, watches television alone at Ruth Paine’s house in Irving. 11:55 AM JFK’s motorcade leaves Love Field for the trip through downtown Dallas to the Trade Mart. John F. Kennedy had ordered the bubble top for the Presidential limo to be kept down: “This is Jackie’s first trip and the people love her, and I’m going to keep it down.” The motorcade is spread over a half mile. 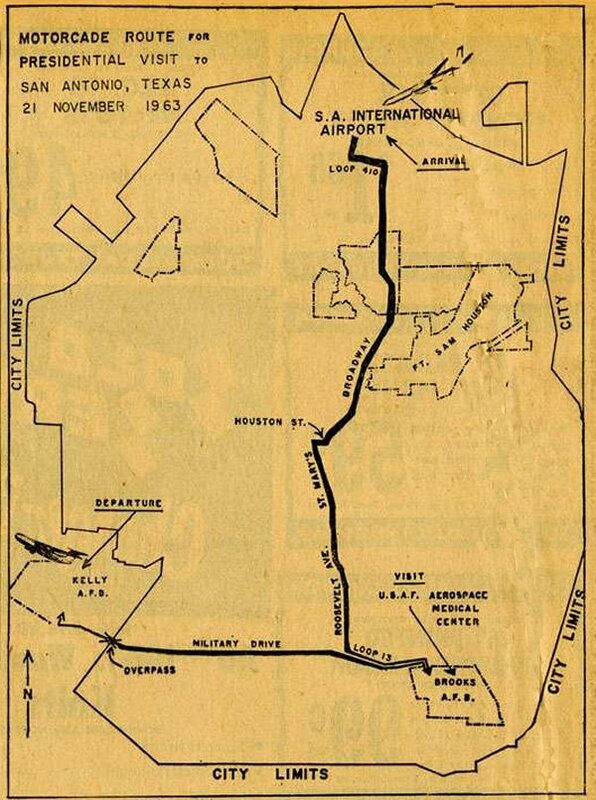 The route scheduled to be driven was as follows: left turn from the south end of Love Field to West Mockingbird Lane, right on Lemmon Avenue, right at the “Y” on Turtle Creek Boulevard, straight on Cedar Springs Road, left on North Harwood Street, right on Main Street, right on Houston Street, sharp left on Elm Street, through Triple Underpass, right turn up ramp to North Stemmons Freeway, to Dallas Trade Mart at 2100 North Stemmons. 12:00 PM Bonnie Ray Williams returns to the sixth floor to eat his lunch. He has brought fried chicken in a paper bag. He does not see Oswald on the sixth floor. 12:06 PM At the cornor of Lemmon and Lomo Alto Drive, Kennedy sees a group of children with a large placard: “Mr. President, please stop and shake our hands.” The limousine stops for a short while. People as far as a block away start to run toward the car. 12:15 PM Arnold Rowland, a bystander in the Plaza, asks his wife if she would like to see a Secret Service agent. He points to a window on the sixth floor where he has noticed “a man back from the window. He was standing and holding a rifle.” Mrs. R. E. (Carolyn) Arnold, secretary to the vice-president of the Book Depository, goes into the lunchroom on the second floor and sees Oswald sitting in one of the booth seats on the right hand side of the room. He is alone and appears to be having lunch. Oswald is obviously not the man holding a rifle in the sixth floor window. Moments later, John Powell, one of many inmates housed on the sixth floor of the Dallas County Jail, watches two men with a gun in the sixth floor window of the Book Depository Building. 12:17 PM Seven eyewitnesses report seeing a man wearing a white or light-colored shirt. Six witnesses (and perhaps as many as 40 inmates) see two men on the 6th floor. 12:17 PM Both Gordon Arnold and AP photographer James Altgens are being denied permission to be on the overpass bridge, by a man claiming to be a CIA agent. No one ever identified this man. 12:17 PM A young man described as wearing green Army fatigues suddenly collapses at 100 N. Houston, near the front door of the Texas School Book Depository. He apparently is suffering some sort of seizure. An ambulance is called at 12:19 P.M. to take him to Parkland Hospital. 12:24 PM The Presidential motorcade passes FBI agent James Hosty. 12:29 PM The police radio, Channel 1, goes dead for at least 4 minutes, rendering communication in the motorcade impossible. 12:30 PM The motorcade turns onto Houston Street from Main Street, and onto Elm Street from Houston Street. William Greer, driver of the limousine, seems to have difficulty making this turn – nearly hitting a curb outcropping in front of the depository. Associated Press photographer, James W. Altgens has now stationed himself at a vantage point on Elm Street across from the Texas School Book Depository Building to photograph the presidential motorcade as it passes through Dealey Plaza and heads onto the Stemmons Freeway. 12:30 PM Abraham Zapruder starts filming and captures the assassination of JFK with his camera. 12:30 PM The first shot has been fired. 12:30 PM The President’s limo is just passing a Stemmons Freeway sign when the second shot is fired. Kennedy is wounded, so is Governor John Connally. A man standing to the right of the freeway sign opens an umbrella, holds it above his head and pumps it up and down as the limousine passes his location. 12:32 PM Dashing into the Book Depository Building, Officer Marrion Baker and manager Roy Truly see and identify Oswald on the second floor (in the lunchroom) within 90 seconds of the last shot. He doesn’t appear to be winded or nervous. He has just gotten a soft drink from a vending machine. 12:36 PM Marsalis Bus No. 1213 leaves the intersection of St. Paul and Elm, going west on Elm Street, bound for Oak Cliff. This bus will travel down Elm Street through dense city traffic. Oswald boarded this bus. 12:43 PM The motorcade arrives at Parkland Memorial Hospital. Jacqueline Kennedy at first refuses to get out of the car. She has been holding the President’s head in her lap. 12:55 PM For almost twenty minutes the emergency room crew in Parkland Hospital’s Trauma Room #1 has been working to revive JFK. 12:57 PM Last rites are administered to JFK in Trauma Room #1 by Father Huber. 12:58 PM Oswald leaves his cab in Oak Cliff. He arrives at his boarding house at 1026 North Beckley Avenue, and hurries to his room. He changes his shirts and grabs his gun. Moments later he is seen at a curbside, near a northbound bus stop. 01:01 PM In Washington, J. Edgar Hoover places a second call to RFK. His terse words are “The President is dead.” He hangs up. RFK notes that the Director’s voice appears very calm, as if he is reporting some minor incident. When CIA chief John McCone learns of the assassination, he rushes to Robert Kennedy’s home in McLean, Virginia, and stays with him for the next three hours. No one else is admitted. 01:01 PM Jack Ruby telephones his sister, Eva Grant, from the Dallas Morning News building. He is in panic. The Texas Theater begins showing newsreels and cartoons prior to the main feature, ‘War Is Hell’. 01:02 PM Oswald is walking south. 01:08 PM CBS anchorman Walter Cronkite announces the death of President John F. Kennedy. He takes of his glasses and tries to hide his emotions. 01:10 PM Officer J.D. Tippit has now supposedly spotted a man walking east along Tenth Street who seems to fit the description of the suspected assailant in Dealey Plaza. Tippit then reportedly stops, and calls the man over to his car. The man walks over to the car, leans down, and speaks to Tippit through the window on the passenger’s side. There is no indication that Tippit is at all concerned about the possibility of danger. Then, according to the Warren Commission report, Tippit gets out and starts to walk around the front of the car. The man Tippit has been talking to draws a pistol and fires from the hip, hitting Tippit in the chest. Officer Tippit is immediately dead. 01:10 PM After the shooting J. D. Tippit, the gunman reportedly goes south on Patton Street and turns west on Jefferson. Two used car lot workers named Warren Reynolds and B. M. Patterson see Tippit’s assassin and start to chase him. The gunman realizes that he is being followed and dashes behind a Texaco gas station, hiding among the cars of a parking lot. Oswald takes off his jacket and hides it under a car. 01:18 PM Ambulance arrives at the shooting scene of J.D. Tippit. 01:20 PM Lyndon B. Johnson is advised by Kennedy’s special assistant Kenneth O’Donnell to return to Washington, DC as soon as possible. 01:22 PM The alleged murder rifle is discovered in the Texas School Book Depository. 01:33 PM Lyndon Johnson, under heavy guard, hurriedly boards Air Force One and tells Colonel James B. Swindal that the aircraft will not leave for Washington without JFK’s body. 01:35 PM A man is noticed slipping into The Texas Theatre at 231 W. Jefferson, without paying. Julia Postal, the theatre cashier, has been alerted to this factby Johny Brewer, the manager of nearby Hardy’s Shoe Shop. Postal calls the police. In the Texas Theatre, Oswald has bought popcorn. War is Hell is playing: Oswald quietly takes a seat in the back of the cinema. 01:40 PM Undertaker Vernon O’Neil arrives at Parkland Hospital in a hearse with a four-hundred-pound Elgin Brittania casket. When Kennedy’s body is placed in the casket, it is wrapped in sheets. 01:45 PM Jack Ruby arrives at his Carousel Club and instructs Andrew Armstrong, the bartender, to notify employees that the club will be closed that night. During the next hour, Ruby speaks by telephone to several persons about the assassination. The remainder of the time he watches television. 01:45 PM Police cars are immediately dispatched to the Texas Theatre. Officers enter the theatre and, after a short struggle, Lee Harvey Oswald is captured. He is transfered to the Dallas Police Headquarters, downtown. 01:52 PM Oswald arrives at police headquarters, heavily guarded. 01:58 PM Kennedy’s bronze casket is being wheeled from the emergency room for the trip to the airport: Love Field. 02:14 PM The bronze casket, containing Kennedy’s body, arrives at Air Force One. 02:19 PM Photographers Smith, Beers, and Allen take photos of of the three ‘tramps’ being escorted by the police through Dealey Plaza. 02:20 PM Dallas doctors’ press conference. Dr. Perry says Kennedy’s throat wound is an entry wound. 02:20 PM FBI agent James Hosty is at the Dallas FBI office, putting together a list of right-wing extremists who potentially might be suspects in the assassination. Supervising agent Ken Howe approaches Hosty and tells him, “They’ve just arrested a guy named Lee Oswald, and they’re booking him for the murder of the policeman over in Oak Cliff.” Hosty says the news hits him like a ton of bricks. 02:30 PM Judge Sarah Hughes arrives at Love Field, and boards Air Force One. Lyndon B. Johnson is to be sworn in. 02:47 PM Air Force One takes off and returns to Andrews Air Force Base in Maryland, near Washington, DC. Love your site. I have been reading about the assassination for 30+ years (and am a conspiracy believer). Actually believe it or not I’m actually of 100% Dutch heritage myself and my grand and great-grandparents came over as immigrants when young. I am from the NW Iowa / SW Minnesota area which has a heavy Dutch population. Were you aware that in this page, in the “11:55am” paragraph, the “route” link links to a .jpg of the San Antonio route, not the Dallas route? Thought you may want to correct this error.